Agaricus blazei is an edible medicinal mushroom species that grows wild in various habitats that are conductive to its growth cycle. It is also widely cultivated and used for culinary purposes, sold dried or prepared as a dietary supplement. The mushroom comes from the genus Agaricus and is related to the common white button mushroom cultivar, Agaricus bisporus. Unlike the blazei species, however, white mushrooms are not considered to have potent medicinal qualities. 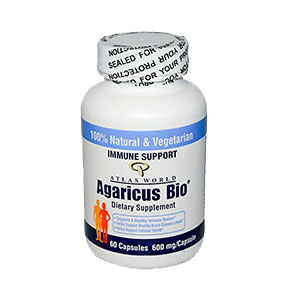 This particular selection of agaricus is well-researched and known for its high amount of polysaccharide content, specifically the class of beta-glucans. These are structural polysaccharides identified in the scientific community for their positive influence on immune system function as well as their inhibitory effect against inflammation and potential tumor growth. Agaricus is, in fact, up on the list with other chemoprotective mushrooms like coriolus and reishi, commonly used in Japan and China as adjunctive agents in chemotherapy treatment. 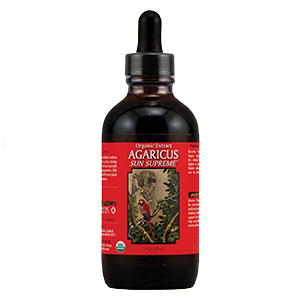 Agaricus is also known for its antiviral properties, as well as its immune modulating activity. In some research, extracts of the Agaricus blazei species are shown to have "therapeutic effects against bacterial and viral infection" and were proposed as potential alternatives to antibiotic drugs. 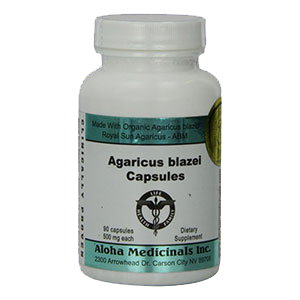 In scientific reviews based on Agaricus blazei extracts, it was also demonstrated to have pharmacological effects potentially useful for a number of diseases, including "chronic hepatitis, diabetes, atherosclerosis and hypercholesterolemia [or high cholesterol]." Medicinal mushrooms have been used historically as healing tonics as well as dietary food sources for centuries in Asian cultures and are still widely consumed and customarily used in traditional Chinese herbal preparations. Agaricus, like maitake and shiitake mushrooms, is another choice gourmet variety utilized for its exquisite buttery rich flavor, subtly sweet almond-like taste and meaty texture. Dried or fresh mushrooms are typically steamed or likewise added to cooked dishes and soup stocks to enhance flavor as well as the nutritional value of a meal. They can also be infused into hot water for a delicious and earthy tasting brew. 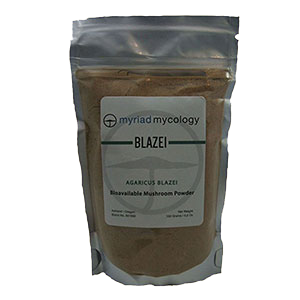 For use as a dietary supplement, the blazei species is predominantly used as a powder or liquid extract. 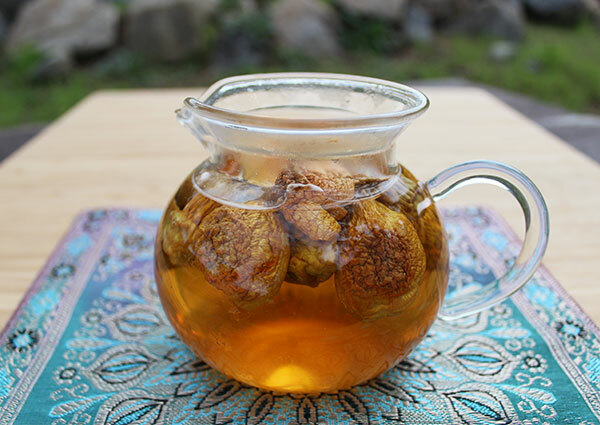 These forms can be added to drinks or hot water for teas or shake elixirs. 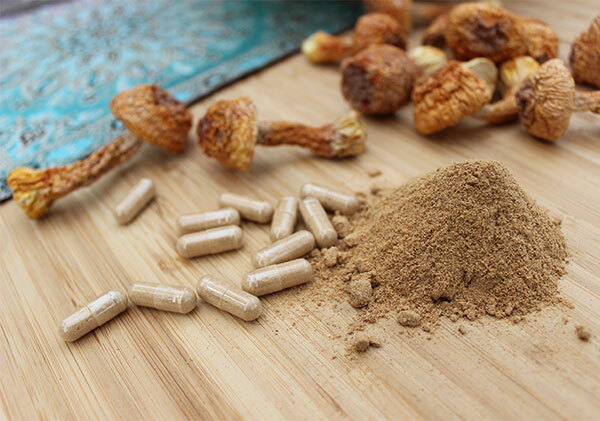 First officially discovered in the late 1800's, Agaricus blazei is not a traditionally used therapeutic variety, but has only just recently been incorporated as such in the last century. 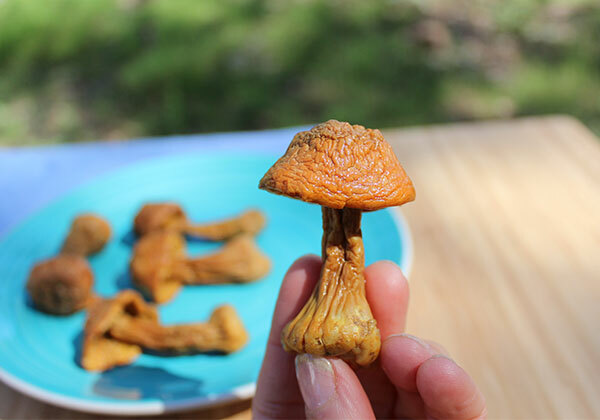 Found growing wild in Brazil by Japanese researcher Takatoshi Furumoto, the mushroom was re-popularized in the 1960's as a medicinal edible and further cultivated in Japan where it has been utilized and studied on a larger scale. Wild and cultivated blazei mushrooms have also been used extensively in Northeast America, where they are sometimes called "almond mushroom." In Brazil the fungi goes by the name "cogumelo do sol" or "mushroom of the sun", in Japan as "himematsutake" and in China as ji song rong. 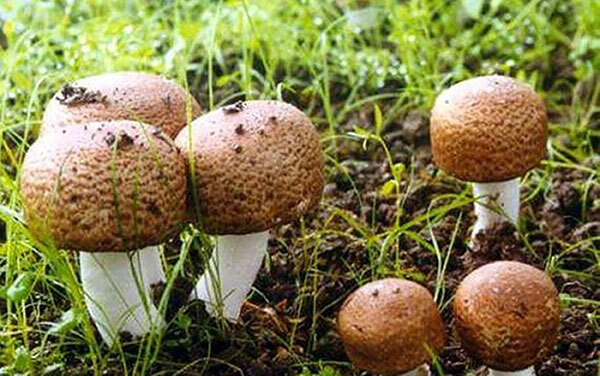 It is also traditionally referred to as "royal sun agaricus." Agaricus blazei is an gilled fungus from the family Agaricaceae. It is related to the most widely grown and consumed mushroom, the white button Agaricus bisporus variety, also known as cremini or portobella mushroom in its more mature forms. Aside from the white button's ability to inhibit aromatase, it is largely void of medicinal properties as it has been reported to have a different composition of polysaccharides which mainly include mannogalactans as opposed to beta-glucans. Agaricus blazei is one of those mycelium strains that prefers warmer climates and partially sunlit areas usually bordering forested canopy regions. This is perhaps one of the reasons it is often associated with the sun in name descriptions such as "mushroom of the sun" or "royal sun agaricus." Depending on the amount of sunlight, the mushroom cap can range from gold, brown to light brown in color. 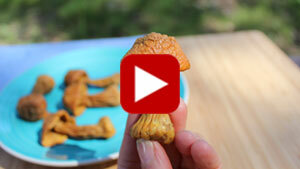 The yellow-orange pigments become more prominent in both the cap and stem when the mushroom is dried or heated. The mushroom caps, approximately 20–70 mm in diameter, sometimes have a squared-off rounded look. 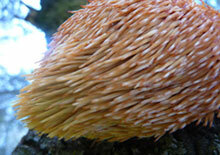 The stipe or stem is typically thick and somewhat bulbous at the base. The best time to harvest the fruiting body for medicinal purposes is before the cap starts to expand or flatten out and release its spores. Although the agaricus mushroom frequently goes by the name Agaricus blazei, there has been some discrepancy among taxonomists about the exact species classification. For the most part, the general consensus is that the species Agaricus subrufescens, Agaricus brasiliensis and Agaricus rufotegulis are all genetically similar fungal strains that were at some point misidentified as the species Agaricus blazei, but still go by this name. Although the name Agaricus blazei is commonly used to describe all three nearly identical mushroom species, its official taxonomy is an entirely different common edible woodland variety that is far less medicinal. To date, when most people refer to "Agaricus blazei" they are indeed referring to Agaricus subrufescens, Agaricus brasiliensis and Agaricus rufotegulis, all of which are generally identified as synonymous under the classification "Agaricus subrufescens." These strains were initially discovered in North America, Florida and later South America. The species Agaricus subrufescens was first reported in the northeastern U.S. in 1893 by botanist Charles Horton Peck. Later in the state of Florida, it was identified by mycologists William A. Murrill, also called "the Mushroom Man." The often used name "Agaricus blazei Murrill" is in his honor. Agaricus brasiliensis is native to Brazil where it was identified growing wild and collected by Japanese researcher Takatoshi Furumoto in Piedade, state of São Paulo, Brazil. It has likewise been found outside of these mentioned locations in regions such as Hawaii, the Philippines, Thailand and Europe. It is also possible to home-grow your own Agaricus blazei from mushroom spores, which can be purchased from online suppliers. Sterile growing conditions as well as air flow, moisture levels, substrate quality and temperature are very important for this procedure, however. Mycelial growth can be achieved between 50-98°F (10-37°C), but prefers temperatures between 73-80°F (23-27°C). For fruiting the mushroom body, temperatures between 68-77°F (20-25°C) are most ideal. The fresh mushrooms are known to have a fragrance similar to almond extract due to the presence of certain compounds such as benzonitrile, benzaldehyde, methyl benzoate and benzyl alcohol, some substances also found in almonds. One of the major health enhancing compounds found in Agaricus blazei mushrooms are its number of beneficial polysaccharides, specifically the highly structured form of beta-glucan molecules. According to the company Dragon Herbs, "Agaricus mushroom is the richest known natural source of beta-1,3-D-glucan and beta-1,6-D-glucan." These constituents, also found in other medicinal mushroom varieties, are known for their structural complexity, involving the frequency, position and length of branching side-chains. These features in effect provide for more diverse biological activity with unique properties that help to regulate or modulate immune responses. They are often called "biological response modifiers" or "host defense modifiers" for this reason. In the published report entitled "The Medicinal Values of Culinary-Medicinal Royal Sun Mushroom (Agaricus blazei Murrill)", in part analyzing the mushroom's effectiveness as an immunomodulating substance, it was noted that "A. brasiliensis contains compounds such as beta-(1→3), (1→6) β-glucans, (1→3)-α-glucans, and protein-polysaccharide complexes, which can enhance in vivo and in vitro cell-mediated immune responses and act as biological response modifiers." In the previously mentioned review on the A. subrufescens species, it was confirmed that "the extract could exert both immunostimulatory and immunosuppressive effects." This essentially means that, as a biological response modifier, it has the ability to "modulate" the immune system depending on the specific needs of the individual and particular health issues. The molecular beta-glucan composition has explicitly been utilized for its potential at inhibiting tumor growth. In another scientific review of Agaricus blazei Murrill, it was stated that "Of the polysaccharides with immunomodulating capacity, only those which consist of a (1→3)-linked β-glucan backbone with (1→6)-linked β-d-glucopyranosyl units as branches produce complete inhibition of tumor growth. (1→3)-β-glucans from fungi commonly have a tumor inhibition percentage of 99–l00%." 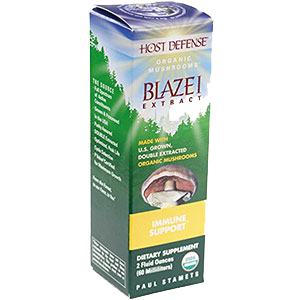 β-D-glucans form part of the cell walls of agaricus and other edible mushroom types. These components are soluble when hot water processed or alcohol extracted which is necessary for human assimilation and nutrient uptake. 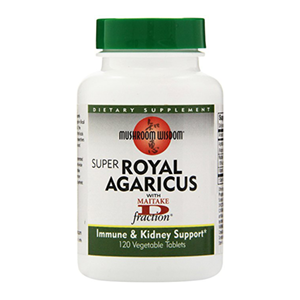 Aside from beta-glucans, agaricus also contains a number of other polysaccharides, including alpha-glucans, riboglucans and glucomannans, that also provide health enhancing benefits to immune functions. In Japan, agaricus supplements and extracts are a popular complementary and alternative medicinal aid used alongside traditional cancer treatments. 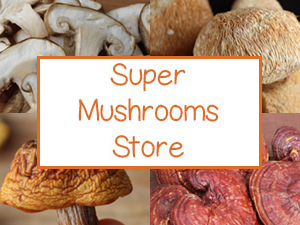 In a 2011 clinical study based on Agaricus blazei's use as a dietary supplement for cancer patients, it was acknowledged that "The most frequently used complementary and alternative medicine products were mushrooms", with Agaricus blazei coming in at over 50% followed by shiitake and reishi mushroom. Other medicinal mushrooms varieties utilized as complimentary "adjuvants" in cancer treatment protocols also include the famous turkey tail mushroom as well as chaga or the Inonotus obliquus species. Beta-glucan branching protein-bound polysaccharides or "proteoglucans" (A-PBP and L-PBP), which are naturally present to defend the blazei mushroom against invasive organisms, can likewise be used therapeutically by humans to fight bacterial and viral infections. These are substances like the polysaccharide-K (Krestin, PSK) found in coriolus mushroom. In some research extracts of A. subrufescens were identified to protect against bacteriums and viruses that cause pneumonia, meningitis as well as some types of herpes and polio. In a study published in the Critical Reviews of Science and Nutrition, it was identified that "soluble NSPs [non-starch polysaccharides], especially mixed-link ß-glucans, lower plasma cholesterol levels and help to normalize blood glucose and insulin levels, making these kinds of polysaccharides a part of dietary plans to treat cardiovascular diseases and type 2 diabetes." In another study on Agaricus brasiliensis tested on diabetic rats, results indicated antidiabetic activity by promoting insulin secretion as well as the suppression of oxidative stress and proinflammatory cytokine production that improved pancreatic β-cell mass. In regards to its effect on inflammation, the Agaricus blazei based mushroom extract, called AndoSan, was shown to exhibit anti-inflammatory effects in patients with ulcerative colitis and Crohn's disease. (*) Water extracts of the mushroom have likewise been studied for their anti-inflammatory actions against osteoporosis. Agaricus blazei is a source of amino acids and high in various amounts of vitamins and minerals, like B vitamins as well as potassium, phosphorus, calcium, magnesium and zinc. It is also a source of ergosterol, a vitamin D2 (ergocalciferol) precursor. This conversion occurs to some degree when the mushroom is exposed to ultraviolet light which causes a photochemical type of reaction, converting ergosterol to ergocalciferol. Ergosterol-containing mushrooms, like agaricus, are sometimes the source of vitamin D used in commercial vegan dietary supplements. In a published journal article entitled "Photobiology of Vitamin D in Mushrooms and Its Bioavailability in Humans", it was proposed that the ingestion of mushroom types, like shiitake, also provide a source of vitamin D2 in addition to vitamin D3 and D4. While according to most research "A. subrufescens has long been consumed as a culinary and supplementary food and has not been reported to be directly toxic or carcinogenic to humans", there have been some controversial reports about its potential toxicity. This is chiefly regarding the raw mushroom's agaritine content as well as its ability to absorb the heavy metal cadmium. 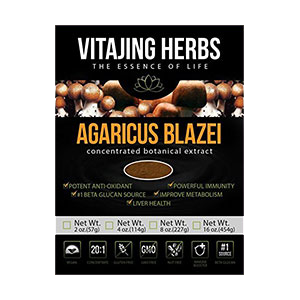 Agaritine is an aromatic substance specifically found in raw mushrooms from the genus Agaricus, which also includes the common white button mushroom. While agaritine has been shown to be a potent antiviral compound, it is also considered to be a hydrazine-derivative mycotoxin in high doses. 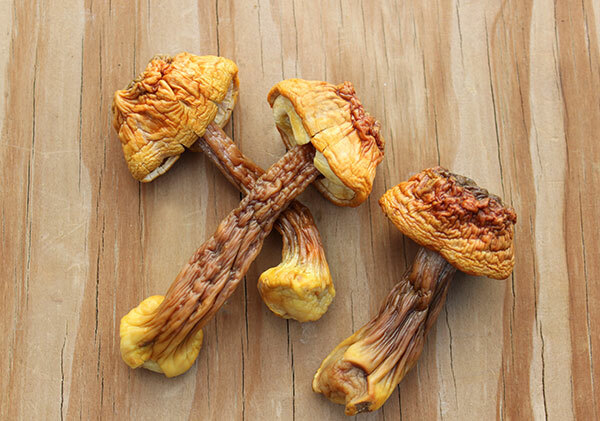 Agaritine is quick to oxidize and degrades rapidly after the mushrooms are harvested. It is also not heat-stable and cooking the fresh or dried mushroom will destroy most of the remaining agaritine compounds. 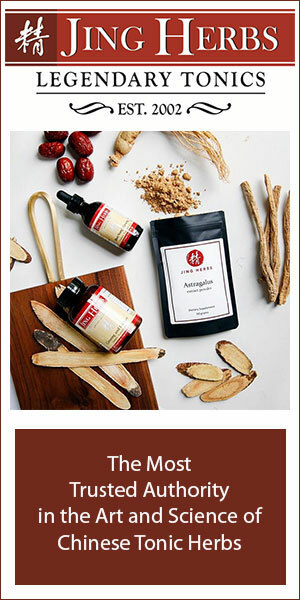 One would assume that A. blazei hot water extracts and tinctures would generally contain low or no agaritine content because of subsequent processing. However, because of agaritine's tainted reputation as a potential mycotoxin, some supplement manufacturers, especially those selling straight dried powders, also ensure purity by adhering to high performance liquid chromatographic testing. Many mushroom species are in fact utilized for their ability to absorb toxic heavy metals from contaminated soils as a way to clean up environment hazards. Agaricus blazei particularly demonstrates a high tolerance for the heavy metal cadmium. (*) Cadmium is a common pollutant that comes from car exhaust or the burning of fossil fuels which can contaminate wild agaricus or mushrooms grown near roadsides or industrial polluted regions. It is important to note that most commercial agaricus sold as a dietary supplement is produced from cultivated varieties that are grown indoors in a controlled setting, which is considerably less likely to be contaminated by environmental heavy metals such as cadmium. We always recommend seeking out higher quality agaricus mushroom products that are preferably certified organic as well as independently tested for potential toxins to ensure purity. Liquid solutions – These are made using a hot water and/or alcohol solution of either or both the fruiting body or mycelium biomass (the white mycelium filaments produced during its vegetative stage). 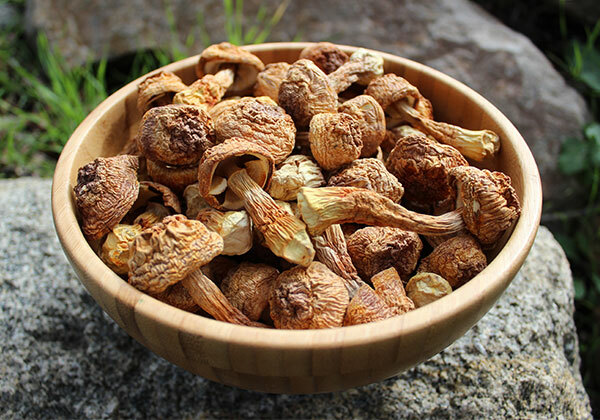 Powdered Mushroom Extracts - Usually prepared using a hot water concentrate that is spray dried to create a bulk powder that can be further encapsulated. These are created from either the mushroom fruiting body or mycelium biomass, or sometimes both. Dried Powders - These are unprepared powders made straight from either the dried fruiting body, the mycelium biomass or the extra-cellular compounds. Products are labeled "full spectrum" when powders, tablets or capsules use a combination of these ingredients. 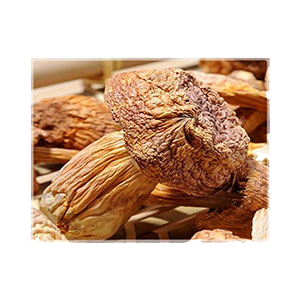 Whole Dried Mushrooms - Dried from fresh whole cultivated mushrooms, rarely from wild varieties. Fresh Mushrooms - These are not as commonly found commercially, but can be homegrown on logs or rice cakes as well as harvested wild in conducive habitat locations with the use of an edible mushroom guide. 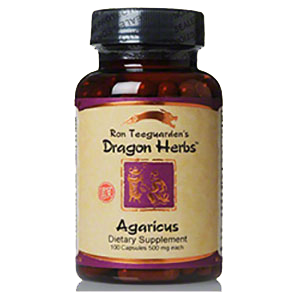 Dragon Herbs - This is an encapsulated 8:1 (meaning 8 lbs of raw product were used to make 1 lb powdered hot water extract) It is created from the freshly dried fruiting body. Aloha Medicinals, Certified Organic - A full spectrum powder created from the dried fruiting body, mycelium biomass, primordia and extra-cellular compounds. Their mushrooms are certified free of agaritine content. Myriad Mycology - This product comes from a small company in Ashland, Oregon and is an extract powder made from the activated mushroom mycelium, labeled to contain at least 15% beta-glucan polysaccharides. Fungi Perfecti, Host Defense - This is a water/alcohol liquid solution extracted from the mushroom mycelium. It is Certified Organic by the Washington State Department of Agriculture. VitaJing - This is an organic bulk extract powder at a 20:1 concentration ratio. Amazon Therapeutic Laboratories - A liquid solution made from the whole fruiting body extracted in water and an alcohol menstruum. Fungiology - A certified organic encapsulated bulk powdered created from both the fruiting body and the mushroom mycelia. Mushroom Science - This is an encapsulated hot water extract of the fruiting body and is listed at 25% polysaccharides. Mushroom Wisdom - A 50:50 blend of concentrated hot water extract and straight powder created from the fruiting body. 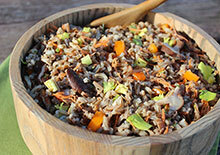 It also includes a smaller percentage of maitake extract and vitamin C as additional ingredients. 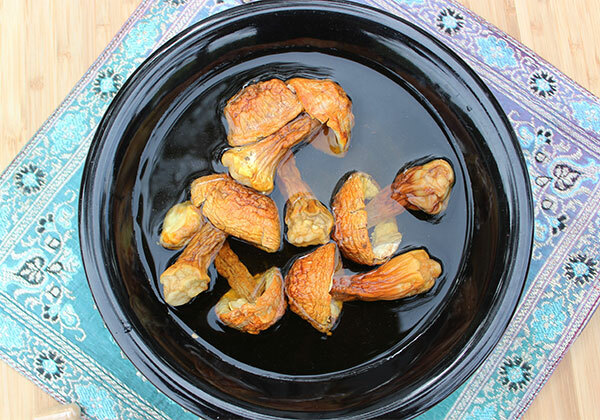 All medicinal mushrooms are therapeutically more effective when steamed or simmered in hot water. This process helps to release their beneficial compounds like polysaccharides and beta-glucans. 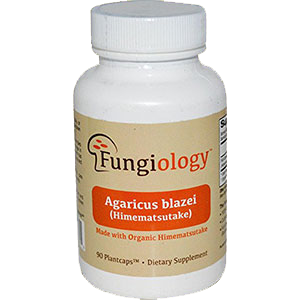 Agaricus blazei mushroom is most commonly used for medicinal purposes as a dietary supplement. As we mentioned, these are usually prepared using hot water and/or alcohol extraction techniques and concentrating the solution into a dried powder or liquid form. It is frequently available as an encapsulated or bulk powder, which can be taken as a capsule or spooned into soups, tonic brews or blended into most any shake recipe. Fresh or dried mushrooms can also be used as a culinary gourmet variety, similar to maitake and shiitake, steamed into sautés, blended into cooked grains and legumes or prepared in soup stocks. 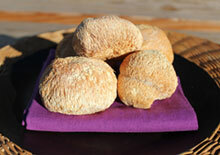 It has a buttery rich and slightly sweet almond-like flavor and usually turns a yellow-orange color when heated. 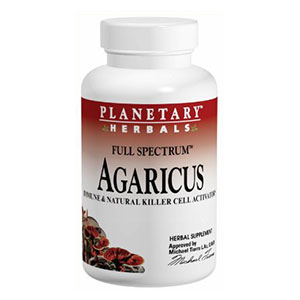 Agaricus synergistically works very well when combined with other medicinal mushroom types as an ingredient in recipes or as a dietary supplement. 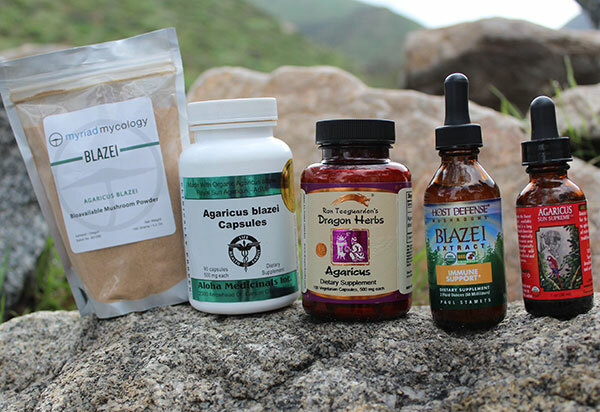 Many brands also offer agaricus in mushroom formulations which often include others like reishi, lions mane, cordyceps and coriolus. 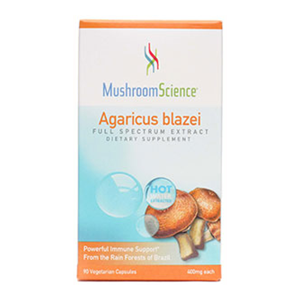 Agaricus blazei is considered a relatively safe non-toxic mushroom species that can be consumed for culinary purposes or as a dietary supplement and used in therapeutic amounts for an extended period of time. Avoid consumption is you have allergies to mushrooms, which may cause digestive upset. It is important to seek the advice of your physician if you have serious medical conditions, are undergoing chemotherapy treatment or taking prescribed medications.